S.P.I.R.E. 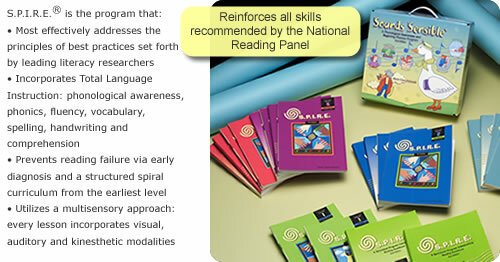 is a comprehensive, multisensory and systematic reading and language arts program designed for struggling readers. It is the only program of its kind beginning at the pre-K level (Sounds Sensible®) and extending all the way through Grade 8. Based on Orton-Gillingham methodologies, S.P.I.R.E. 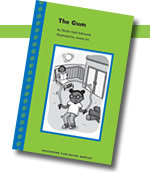 incorporates the most recent research regarding best practices in reading and language arts instruction to help struggling readers excel. This fully integrated curriculum provides direct instruction in phonics, decoding, reading comprehension, spelling, vocabulary and written language skills. The scope and sequence begins with simple skills and moves to more complex, spiraling concepts in order to bring student to full literacy. Initial placement in S.P.I.R.E. is determined by student skill level. The 8 levels of S.P.I.R.E. can be completed within 2-4 academic years, as dictated by the needs of individual students. Detailed, structured, 10-step lessons blend visual, auditory and kinesthetic instruction to ensure mastery. Introductory Lessons introduce new concepts and are followed by Reinforcement Lessons, which practice the new concept and review previously taught concepts. The appendices provide an unparalleled resource of word lists, phrases and sentences to further aid in lesson differentiation. These comprehensive resources contain Key Word Concept Sheets, Key Word Cards, Phoneme Segmentation Sheets, Sight Word and Decodable Word Cards, Small Letters, Word Find Sheets, Dictation Paper, Concept Mastery Fluency Drills and Decoding Assessments. These student books include fully decodable word lists, sentences and reading selections that are carefully controlled for phonetic elements and sight words. The quantity of selections presented for each new concept is unique to S.P.I.R.E. and gives teachers the flexibility to select instruction appropriate to the needs of their students. 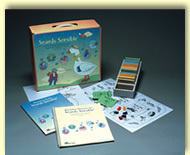 Acetate sheets and markers are available separately for students to interact with the text. These consumable books provide independent decoding, fluency and comprehension practice for every concept and reading selection. All text, including exercise directions, is decodable.